Hope it did not rain on your Easter parade or party. It certainly did on the slopes of Avebury, down which we have a tradition of rolling eggs on Easter Sunday. The result was a lot of slipping, sliding, and laughter. We hope it won’t be this wet at dawn in two week’s time, for the start of the Festival, outdoors at 5.30am on 5th May on that high ridge overlooking Swindon. 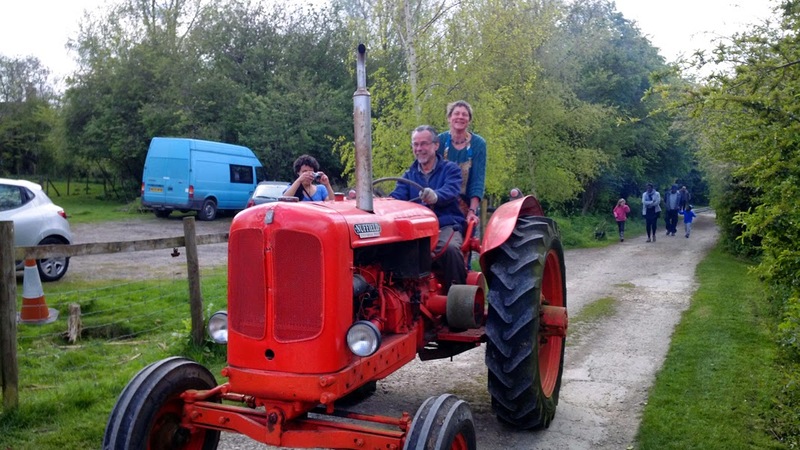 Here, at Lower Shaw Farm, the Festival’s HQ, we have bought a tractor. But not any old new tractor. Oh no. It’s a red tractor, a running tractor, a beautiful old 1952 Nuffield Universal diesel tractor. This weekend, it came to live, work, and play at LSF. We already have plans for its participation in the Festival. You see, we hope it will please the eye, fire the imagination, and inspire writers and readers the way that famous imagistic wheelbarrow poem does. The red tractor has already been out doing its stuff. On Sunday, it led an Easter Bonnet Parade up Old Shaw Lane and, not surprisingly, turned a few heads. If you want to meet it, come to the very start of the Festival, the Dawn Chorus: love at first light on the first Bank Holiday Monday in May. It might well be a happy red tractor day.